The treatment, called Lemtrada, has been used around the world for several years. But it's been a long road for drug approval here in the US. It's a condition where the body disrupts the nervous system. Multiple Sclerosis, or MS, affects more than 400,000 people here in the United States. A new and highly anticipated treatment for MS has now made it's here to our region. In 2002, Melissa Gray from Ashburn was having an unusual episode. Gray says, "I was having difficulty speaking, my speech was slurred, and my walking, I wasn't walking straight." She went to a doctor who simply said she was dehydrated. Her family was not convinced, so she went to an ER. "I went to the emergency test and they did a CAT scan and it showed that I had like a million lesions on my brain," says Gray. Melissa found out that she has multiple sclerosis. It's a condition where the immune system attacks the lining surrounding the nerves in the brain, causing them to malfunction. These attacks happened periodically. Over the years Melissa used many different types of treatments for relief. But, eventually the attacks started happening more frequently. Melissa sees Dr. Heidi Crayton of the Multiple Sclerosis Center of Greater Washington. Dr. Crayton also worked on a clinical trial that could help patients like Melissa. Dr. Crayton says, "There were some issues that kind of needed to be hammered out between the company and the FDA. Clinical trial design and things like that." There was a huge push from the MS community and healthcare patients to get this medication approved. Finally in December of last year, the FDA approved Lemtrada. "It's a once a year infusion. This medicine actually works by rebooting the immune system. It kind of wipes it out, and reboots it, a kind of healthier, better immune system if you will," adds Dr. Crayton. Melissa is the first patient here in the DC area to receive this new treatment. Gray says, "Yes if this can help me, i'm all for it, i'm all for it." Other MS treatments require frequent pills or shots. 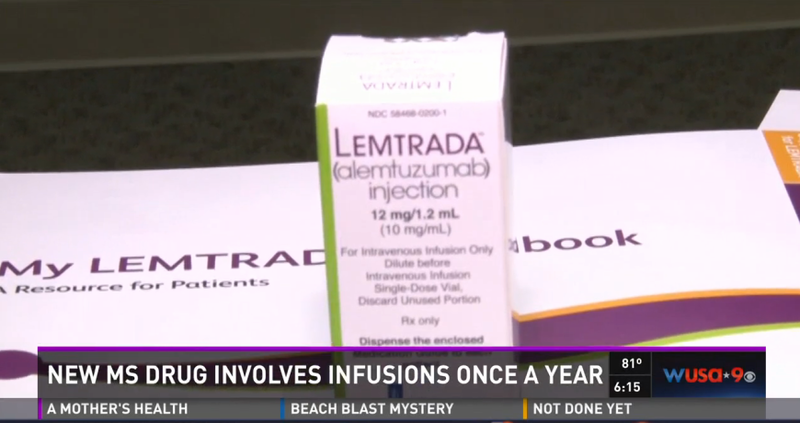 Even though Lemtrada requires infusions once a year, patient compliance is still very important as blood work is required every month regardless of how they feel. There are also a host of potential side effects including rashes, headaches, an increased risk in thyroid and autoimmune problems.